Thanks to Karin Kolbe for the information and images. The IMA show was held at the Nürnberg Exhibition Centre, Nürnberg, Germany over four days from the 14th to the 17th of January - exactly one week before the ATEI show in London. 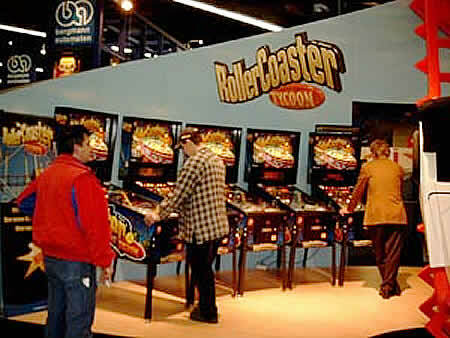 This is a tough time for the German coin-op market and the IMA show seemed doomed to die out as a major event. Unemployment is high in the country and taxes have headed the same way. Report suggest there were only 120 video games sold in the whole of Germany in 2002. Internet cafes too have had a hard time - they are being taxed the same as gaming machine locations, as many customers are using the computers to play online games. 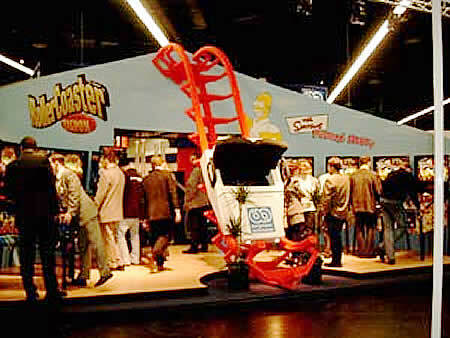 But Germany has a new distributor for Stern Pinball games and Bergmann were eager to show off the products with a prominent stand featuring a section of rollercoaster track and a two-seater car. 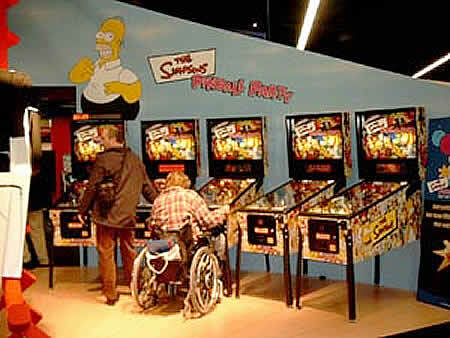 There were five Rollercoaster Tycoons and five Simpsons Pinball Party games, one of each type was fitted with the ToPS tournament system. With a specially constructed stand, Bergmann really showed off both games to their full potential, so let's hope the sales live up to the effort put into selling them. 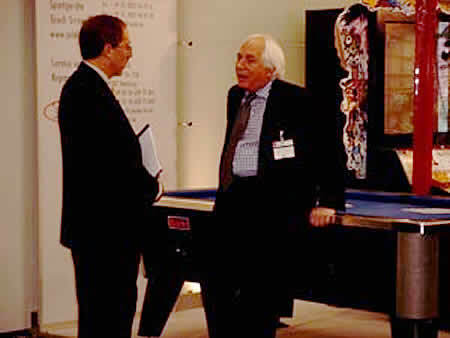 As usual, Gary Stern was there to promote his company's wares. Overall the show continued the improvements of last year and it looks like IMA has secured its place on the international calendar.